Search Results for "fishing underwater"
Trout fishing underwater in stream of water of Lena River in Siberia of Russia. Inhabitants of Salmo in wild on background of clean and transparent water. Unique relaxation video about nature. Tuna fish tunny underwater in search of food in Maldives. Unique macro video. Underwater fishing. Natural aquarium of sea and ocean. Beautiful animals. Woman in Googles underwater fishing, swimming over reef near rocks. Sunny day. Fish rigged live bait on hook underwater. Fishing. Grayling fish on the hook underwater on fishing in Mountain river Temnik. Clean water and stone rock bottom in spring. Ecotourism in Siberia of Russia. Grayling fish underwater on fishing in Mountain river Temnik. Border of Baikal State Nature Biosphere Reserve. Clean water and stone rock bottom in spring. Ecotourism in Siberia of Russia. Retro style fisherman catching fish. Trout fishing on mountain river. 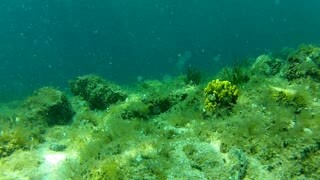 Underwater video through water level.